In the spirit of the Rock Bund Art Museum exhibition Advance through retreat, the Qi Dance Project presents a live performance - Silent Hands - to explore the intimacy between the silence of spiritual reflection and the performativity of body, sounds and words. The dancer, the musicians, the poet and the peintor introduce a dialogue with the other works of art in the space of the museum, evoking the symbols of social order (Arc de Triomphe – for personnal use of Jimmie Durhan), memory and institution (Thinking of You by Yang Jiechang), evanescence and circulation (Another Kind of Aesthetics from Yangjiang Group). In the space between stillness and action, expansion and retraction, memory and oblivion, indolence and desire, they explore the contemporary constitutions of autonomy and movement. Silents Hands have been performed in Rock Bund Museum the 20 of June 2014, and in Aurora Museum, the 22 of June 2014. 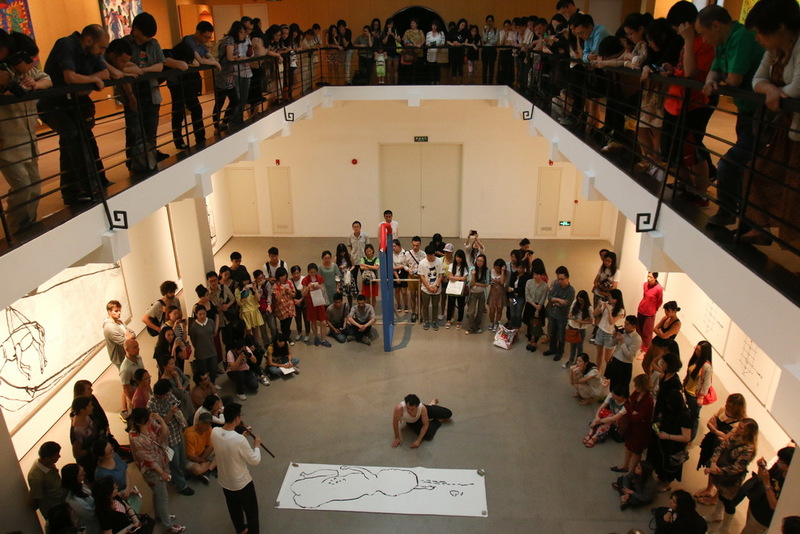 With CHENAULT Marceau (Dance), HORTIZ Horacio (poetry), 李瑞 LI Rui (Flute)潘小丽PAN Xiao Li (Erhu), 宣颖 XUAN Ying (Drawing).